The stylish and vivacious Connie Callahan was born June 9, 1950 in Palo Alto, California. She graduated from Stanford University with a degree in English in 1972, and received her JD from Pacific McGeorge School of Law in 1975, and received her LLM from the University of Virginia School of Law in 2004. She worked first as a Deputy City Attorney for the City of Stockton and then as a Deputy District Attorney for the San Joaquin County District Attorney's Office until 1986, when she was appointed Commissioner of the Municipal Court for Stockton Municipal Court. 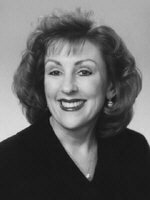 In 1992 she was appointed to the Stockton Superior Court, and in 1996 was elevated to the Third District Court of Appeal. She left the Third DCA in May 2003 to accept an appointment to the United States Court of Appeals for the Ninth Circuit, where she currently serves.